Imagine this: it’s 8 am, and you decide to stop into a coffee shop to grab a much-needed shot of caffeine on your way to work. You walk through the door and are confronted with a massive line, leading right to the door. As you steal a glance at the clock, you tell yourself the line is moving fast and decide to risk being late to work. Nothing gets in between you and your espresso. Is this situation sounding familiar? I’ll spoil the ending for you–the coffee shop takes much longer than expected, and you’re late to work again, getting a displeased look from your boss. If this is a morning ritual for you, like it is for many people, it might be time to change your game plan. Why go through the trouble of going to a coffee shop if you could recreate your favorite drinks at home? It’s possible with a Nespresso Machine. A Nespresso Machine is a pod-based espresso machine that dispenses various espresso drinks as well as coffee (with the newer models). These machines run off of Nespresso pods, which are pre-packaged pods of single-serve coffee, similar to K-Cups. The concept is the same: you pop in a Nespresso pod, choose your drink of choice, and viola! Coffee on demand with minimal preparation and clean up. Nespresso machines first came onto the market in 2014, debuting with their Original Line that featured standard pump espresso machine technology. These machines did not allow you to dispense coffee. 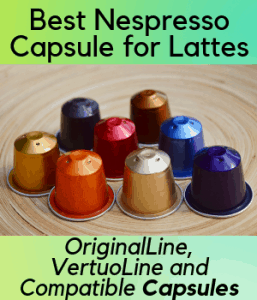 A few years later, Nespresso released the Vertuo Line. The main differences were the ability to brew a cup of “normal” coffee, foamier drinks, and smart-pods that come with barcode technology. The change in pods is significant because it means you can’t use cheaper, third-party pods. If you’re thinking of upgrading to the Vertuo Line, this may be a point to consider, especially because the newer pods are also slightly more expensive. There’s no real consensus on whether the Vertuo Line brews better tasting espresso, but it does come with the benefit of being able to brew coffee, for days when espresso might be too much. If you’re someone who stops by the coffee shop every morning, it might be time to rethink that expensive habit and invest in a Nespresso machine. These machines are perfect for people who love a handcrafted espresso drink, but don’t love the price tag. Not only will this machine save you money, but it’ll also help you avoid those dreaded coffee shop lines and all-too-chipper cashiers. So those of you with a Starbucks gold card or a coffee shop punch-card, stop blowing your budget on 5 dollar drinks. It’s easier than you think to be your own barista. Versatile: One of top reasons buyers choose the Nespresso machine is for its versatility. High grade espresso machines only brew espresso and high grade coffee machines only brew coffee. Finally there’s a machine that offers the best of both worlds. Switch seamlessly from coffee to espresso, all while using the same pods. Keurig, the biggest pod-based coffee competitor, discontinued its model that brews espresso, making the Nespresso the espresso lover’s first choice. Cost-saving: Purchasing espresso drinks at a coffee shop adds up quickly. At about $0.90-$1.25 per capsule, a nespresso pod is a significantly cheaper option and can end up saving you over $1,000 annually! Convenient: There’s nothing like waking up and having that first sip of coffee. Rather than learning to use a complicated espresso machine or purchasing a drink, this machine makes handcrafted espresso drinks easy. One push of a button and you’re done. Customize-able: Maybe the barista down the street knows your drink order, but do they get it right every single time? With a Nespresso, you are in control. You can choose the amount and texture of milk, the size, and the temperature, giving you the customizability you didn’t even know existed. Better Tasting: There’s a consensus on the internet. The Nespresso just makes better tasting coffee than a Keurig. So if you’re looking for the convenience of a pod-based coffee machine, and you’re not willing to compromise on taste, you are better off with the Nespresso. Eco-friendly: Nespresso pods are recyclable, making your morning drink a guilt-free treat. Costly: I know what you’re thinking, I just stated the Nespresso is cost effective! While it is cost saving in comparison to purchasing coffee on-the-go, it is the most expensive pod-based coffee machine. The machine itself is more expensive than a Keurig and the capsules are 2 to 3 times more expensive than K-cups. If you compare the costs to a french press, Aeropress or traditional coffee machine that relies on coffee grounds, that price discrepancy grows even larger. All in all, if you’re perfectly happy with drip coffee out of a 20 dollar machine, it may not be worth upgrading to a pricier method. Maintenance: Making the coffee takes only the touch of a button, but cleaning it involves a few more steps. If there’s a milk tank, it must be removed and stored in the fridge or washed after use. The milk frother needs to be cleaned and the machine needs to be descaled every so often. If you looking for a truly low or no maintenance machine, you may want to look at other options. Not compatible with third-party capsules: If you are in love with Nespresso pods, then this may not be a con for you. However, it is important to note the new Nespresso machines don’t accept third-party capsules, which may be cheaper, or refillable pods, which are environmentally friendly and would allow you to load the machine with your favorite local coffee grounds. A wide range of cup sizes: Sometimes you are in the mood for one shot of espresso and there are days when you need two. Get a machine that allows you to choose, like the Nespresso Vertuo Coffee and Espresso Bundle. An Attached Milk Frother: Never settle for less froth than you want. With an attached milk frother, you are in control of how much foam you want, what texture you want it to be, and its temperature. Check out the Nespresso Breville Creatista. Dishwasher Safe Parts: Make clean up a breeze by getting a machine with dishwasher safe parts like the Nespresso Lattissima. Fast Heat-Up: The lightning fast speed of some of these machines may blow you away. While it may have taken you 10 minutes to order and get your espresso, it can take you as little as 3 seconds to heat up your machine so it’s ready to dispense. Are you ready to step up your coffee game? With the high quality Nespresso machines that are currently on the market, anyone can be a barista. Latte drinkers rejoice, you no longer have to wait in the dreadful line at Starbucks at 8 am every morning to get your fix. Whether you are craving a good ol’ cup of joe or a handcrafted latte, you can make it from the comfort of your own home (and without that hefty price tag) with the Nespresso Vertuo. In terms of price, the Nespresso Vertuo Coffee and Espresso Bundle is mid-range. The price range for similar espresso machines varies greatly, so if you are looking to spring for an espresso machine without breaking the bank, this machine is a good option. This product has proven to be a popular choice for both longtime fans of nespresso pods and avid k-cup users, highlighting its wide appeal. For a specialty coffee machine, the Nespresso Vertuo has attracted a solid base of buyers, the majority of whom have left glowing reviews. Users state that this machine is a big hit in their home, offering convenience and durability for a relatively affordable price tag. It even produces coffee drinks that rival the ones purchased from a coffee shop. Even though Nespresso pods are a bit pricier than your typical k-cup, buyers state the higher price is representative of a bolder, richer taste. The most frequent complaint of this machine is the temperature of the espresso dispensed. Many users state they would like the espresso to be hotter, while others state the temperature is perfect for drinking immediately. The look of this machine is futuristic, featuring a sleek spout surrounded by two piped cylinders in a symmetric design. The effect is both high tech and simplistic. If you wanted a bolder look, this machine comes in a red option, but if you are looking for something less flashy, you have your classic black, matte black, grey, and chrome choices. Automatic Blend Recognition: Without having to lift a finger, this machine automatically detects the blend of your nespresso pod and changes the brewing parameters to ensure your cup is delicious, every time. Capsule Disposal: The machine automatically ejects the capsule after each cup, meaning one less step in your clean up process. 5 Cup Sizes: Personalize your cup by choosing from a variety of sizes ranging from 1.8 oz (espresso) to 14 oz. If you are a latte drinker that’s tired of settling for boring old coffee in the morning, it may be time to shake up your routine and purchase the Nespresso Vertuo to satisfy your coffee and espresso needs. If you’re looking to step up your coffee game, it might be time to invest in the Nespresso Lattissima Plus. This machine allows you to make barista-quality lattes, macchiatos, and cappuccinos, bringing the coffee shop home to you. This machine is on the higher-end of the price scale. As such, the Nespresso Lattissima Plus is not for your casual espresso drinker. Rather, it’s for the espresso drinker willing to splurge for top-notch drinks. Garnering high praise from its users, this product has a good track record with coffee and espresso lovers alike. It’s quality and reliability are the main drivers of its high ratings. The Nespresso Lattissima is nothing short of revolutionary according to its buyers. They say that this product has completely changed the way they drink coffee. Lattes, macchiatos, and cappuccinos are within reach with just a touch of a button and the taste is comparable to Starbucks or other coffee shops, without all the hassle. Buyers are also blown away by the ease of using and cleaning this machine, noting that it’s much simpler to use than other espresso machines. It’s a barista grade machine that doesn’t require you to be a barista in order to enjoy it. Another praise worthy element of this machine is the compactness. The sleek machine features two tanks, one for water and one for milk, and four preset beverage buttons, making this espresso machine very accessible. Automatic Cappuccino System: Get perfect coffee shop foam on top of your homemade lattes and cappuccinos, every time, without having to break out a separate machine. One Touch Simplicity: You don’t have to be a rocket scientist to work this machine. All it takes is one button to dispense your custom drink. Barista Grade: Do you ever wonder how coffeeshops pack so much flavor into one little cup? It’s the high pressure of their machines, which is included in your machine. Dishwasher Safe: Clean up is easy with dishwasher safe parts. For espresso and coffee drinkers looking to step up their game, this machine is a great investment that offers versatility and ease of use. An all-in-one machine, the Nespresso Lattissima Touch makes creamy lattes with the touch of a button. Not in the mood for espresso? You can always switch back to coffee. With this machine, you never have to settle for a drink that doesn’t fit your tastes. In comparison to similar coffee/espresso machines, this product is expensive. However, the high price is reflective of high quality. Users love this machine and can’t stop raving about it. If its reviews are any indication, this machine is sure to be a top-seller amongst espresso aficionados. As many users have noted, this is the machine to buy if you are looking for a perfect, creamy latte. This model specifically has a button for a creamy latte, and buyers cannot get enough. They also love the customizability of the milk frother that gives users the ability to control the thickness and amount of froth in each drink. You can be your own barista with this machine. Overall, users agree that this machine makes consistently great coffee and espresso with the added plus of looking beautiful on your countertops. The design of this machine is very simplistic, with soft-curved edges and geometric features. Its European design is user-friendly while remaining wholly functional. It is also compact, able to fit easily under a cabinet or on a desktop. Fast Heat-Up: With a heat up time of 40 seconds, you won’t have to wait long to enjoy a sip of your favorite beverage in the morning. Milk Frother: Feel like a professional barista with the attached milk frother and treat yourself to a decadent latte with as much foam as you please. Easy Clean Up: Used capsules dispose directly into a storage container so clean up is a breeze. Best of all? The capsules are recyclable. Intuitive Descaling: Skip the guessing games, the machine will let you know when it needs to be descaled. If you are looking for a no-fuss dual coffee and espresso machine that makes a killer latte, this is the machine for you. This machine is the answer to your gourmet espresso cravings. With the Breville Nespresso Creatista, you have complete control of the amount, texture, and temperature of your drink, meaning you’ll get a latte perfectly suited to your tastes every time. Who knows, this machine may even give Starbucks a run for their money. This machine’s price tag is not for the faint of heart. While cheaper than a professional espresso machine, the Breville Nespresso Creatista is on the high end of price in comparison to similar products. A well-loved product, this machine has received almost entirely positive feedback from users. Buyers love how this machine takes the guesswork out of making complicated espresso drinks. They say it’s easy to use, easy to clean, and extremely reliable. Users are obsessed with the ability to choose the temperature of the milk, saying that similar products do not offer this customizability. But most importantly, users agree that this machine makes a darn good cup of coffee. Looking like a miniature version of the high-grade espresso makers you might find at a local coffee shop, this machine is, well, adorable. With the water tank tucked away behind the machine, its features are simple and no nonsense. One thing’s for sure, this coffee maker is markedly different from similar products, resembling an espresso machine more than a traditional pod coffee maker. Barista Grade: This machine is fully customizable, with settings to adjust coffee volume, milk temperature, and milk texture. Fast Heat-Up: Putting similar products to shame, this coffee machine heats up in 3 seconds. Yup, you read that right. Milk Frother: Give your drink that extra special touch with a little (or a lot) of foam. For serious espresso drinkers with an affinity for latte art, the Breville Nespresso Creatista is your dream come true. The Nespresso Inissia with Aeroccino is a no-fuss machine that delivers a perfect cup of coffee or latte with one button. If you’re looking to ramp up your morning routine, you don’t have to look any further. For an espresso and coffee machine duo, this product is very affordable. It is on the low-end of price, and yet users state it holds its own in comparison to more expensive products. This product is very popular with espresso and coffee drinkers, garnering high reviews for its quality and affordability. Buyers of the Nespresso Inissia with Aeroccino highly recommend this product, saying that while it has a low price, it certainly does not produce low-quality coffee or lattes. It is also an obvious choice for buyers with a small kitchen that might not be able to accommodate a large, clunky espresso machine. Users marvel at its speed and convenience and can’t imagine going back to a traditional coffee maker. Although not the most aesthetically pleasing machine, the Nespresso Inissia with Aeroccino is compact and space-saving. The overall design resembles neither a traditional coffee nor an espresso machine. Lastly, it comes with a separate milk frother that matches the black and stainless steel color scheme of the coffee machine. Speedy Heat-Up: Small, but mighty, this machine heats up in just 25 seconds. Milk Frother: Add the finishing touch to your drink with a light or heavy froth. Removable Drip Tray: This machine accommodates even your larger travel mugs with ease. Large Water Tank: Don’t waste time constantly filling up your water tank. Instead, this machine’s capacity allows for 9 full cups of coffee and even more cups of espresso. For espresso lovers on a budget, who don’t want to sacrifice quality, the Nespresso Inissia with Aeroccino is the product for you.